Chocolate cake. Shredded vegetables in a savory sauce. Macaroni and cheese. These simple foods, found in grocery stores across the U.S., have gone through countless sensory tests to ensure their consumer desirability. Food science Professor Amy Lammert, who holds a doctorate in food chemistry, teaches students the hands-on practice of sensory testing from start to finish. 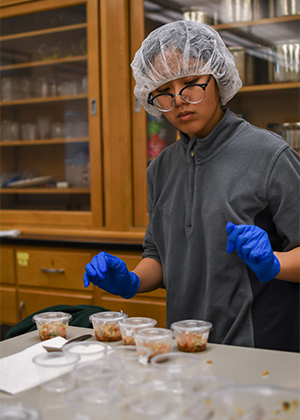 In her classes, students learn about product development, including sensory analysis, working with corporate sponsors to develop new foods, and improve existing products. Cal Poly students play an integral role as companies work to embrace current consumer trends such as eating whole foods and increasing vegetable consumption by conceptualizing and marketing products that customers want. “At the end of the day, it is the consumer making a choice on how to use their dollar to purchase the food,” Lammert said. It is one thing to teach sensory testing in class, but another to be accountable for delivering results to someone who has a need. Sensory and consumer testing is the link between the development of a product from concept ideation through processing and its placement on the shelf to be chosen by consumers, she said. “Any food company as it evolves is going to need some sort of consumer sensory testing,” Lammert said. “Companies use it because the cost to innovate and create a product is high, and they want to reduce the risk of innovation by engaging the consumer in product creation.” Companies use the test to gauge the response to new products and to ensure that subtle changes in already popular products, such as changing sugar suppliers, go undetected. Outside of class, some students work with Lammert to do direct sensory testing for companies. “It is one thing to teach sensory testing in class, but another to be accountable for delivering results to someone who has a need,” Lammert said. Students who are interested in learning more about sensory work go through an interview process, are screened by Lammert, graduate students, and are then hired to be a part of the group. used in a sensory test. Sean Frisby (Agribusiness, ’91), senior director of brand engagement and communication at Green Giant Fresh, has worked with Lammert’s class to develop marketable products. Each year, using a network of Cal Poly employees to sample products, students conduct as many as 15 sensory tests for companies. Students collaborate directly with companies to design questionnaires about their products, develop a timeline, order supplies, recruit people based on desired demographics to do the survey, prep the foods to be sampled, conduct the test, and then analyze and report on the data. is the lead sensory technician for Lammert’s on-campus sensory testing, helping to manage and conduct sensory tests on food products from outside companies. “Sensory testing is an important aspect of the food industry as it gives valuable insight on new and existing food products in order to help satisfy consumer preferences and needs,” Egigian said. Tested products have ranged from beverages and baked goods such as cakes and pastries, to fruits and vegetables and pasta sauces. Students learn skills that translate directly to industry jobs, going on to work in leadership and management roles in multinational corporations and at such well-known companies as Conagra, Mission Produce and Impossible Foods. Visit the Cultivate Summer 2019 Page to read more stories.